Reflections On An Afternoon At The African-American Museum : 13.7: Cosmos And Culture Barbara J. 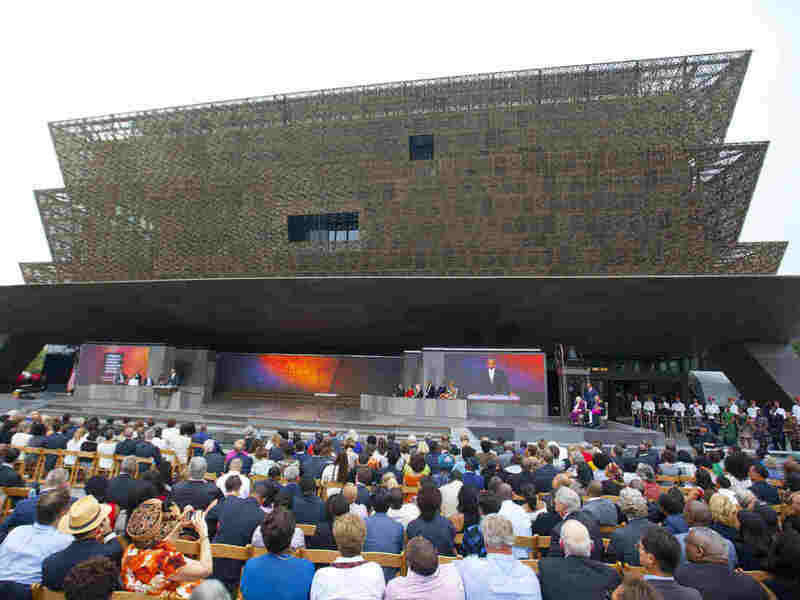 King says the legacy of slavery and resistance came alive in her visit — and that she was acutely aware that for some, a visit would be rooted in experiences she could never truly fathom. President Barack Obama speaks during the dedication ceremony for the Smithsonian Museum of African American History and Culture in Washington, DC, on Sept. 24, 2016. Three stories beneath the streets of Washington, DC, I stood on the bottom level of the Smithsonian's National Museum of African American History and Culture — for just a moment alone — as people flowed in all around me. In front of me stood a stone block. Dating from the 19th century, the block, made of marble, once could be found in Hagerstown, Md. On it, enslaved people brought to the U.S. from Africa were sold at auction. Some moments before, I had viewed a piece of timber from the Portuguese slave ship São José, which wrecked in 1794 while carrying 400 enslaved people en route from Mozambique to Brazil. Half of those people died as a result of the wreck. The Atlantic slave trade went on to become the world's largest forced migration of men and women by sea. In those purposefully "hushed, claustrophobic halls" — as The Atlantic's staff writer Vann R. Newkirk II describes them — I had also seen iron shackles used to bind and control the movement of those enslaved persons. By the time I reached the auction block, I needed a moment to stop, be still, and reflect. Through these objects, the terrible history of racism is brought vividly alive. I imagine that this is the way it is for other visitors too: people walk along, try to take in some of the nearly 37,000 objects, documents, photographs and other media items on display at the museum and, suddenly, this thing here or that thing there roots them to the spot. The museum, the Smithsonian's newest, opened on Sept. 24, 2016. Beginning in 1988 and continuing for 15 years, civil rights activist and political leader John Lewis (D-Ga.) fought for legislation to allow the museum to be built. That legislation passed in 2003. When, 16 years later, the building was dedicated, in eloquent remarks Lewis called it "a dream come true." "It's really a place where you can go and bow your head, and think about all those who experienced the Middle Passage, all those who were lost. So it's both a scholarly moment, but also, for many people, it will be a highly personal moment." As I walked along, I experienced moments of emotion. Yet I was also aware, acutely so, that for some people also visiting the museum that afternoon, a "highly personal moment" would be rooted in experiences I could never truly fathom. For decades, I taught College of William and Mary students about race and racism from the point of view of anthropology — explaining that race is not a biologically meaningful category, and sharing the American Anthropological Association's statement that "the 'racial' worldview was invented to assign some groups to perpetual low status, while others were permitted access to privilege, power, and wealth." Yet teaching important facts are not living those facts. I know that I'm able to write this piece from a perspective that is rooted in a certain physical and psychological safety. At the museum, I had the opportunity to strengthen my knowledge of the resistance actions of enslaved persons in the U.S., and of the contributions African-Americans have made to our science, our art, our sports, our democracy, our culture. An object I gazed at for a good while was a 19th-century violin that had belonged to an Arkansas man named Jessie Burke, who played it both when he was enslaved and free. Musical instruments were often played by enslaved people at community gatherings — gatherings forbidden by their owners. In this way, oppressed people came together to make art and find strength in each other. Musical resistance, if you will. On the glass case in front of this instrument was printed a quote attributed to Charlie Crump, who had been enslaved in North Carolina: "We ain't allowed to go nowhere at night. That is, if they knowed it." It was a remarkable experience to wend my way through the galleries surrounded by people of many colors and ethnicities. The "dwell time," or the time visitors are spending at the African-American Museum, is off the charts — going up to six hours. In November, Associate Director Beverly Morgan-Welch told NPR that the normal dwell time in museums is about two hours. Our timed tickets were for a 2:45 p.m. entry, so we didn't have six hours. There were whole floors I didn't see, and wish I had. But it is possible to have a meaningful experience at the museum in two or three hours, one that later can be enhanced by exploring here the online collection.